I know your life is busy, and you probably don’t have as much knitting time as you’d like. Or maybe you don’t have the time you need to learn a new technique, like lace. The effort you have invested in your knitting needs to pay off, doesn’t it? The projects you choose need to be versatile and wearable, across all seasons, and anything new that is learned on your needles should be shown off as often as possible. The Aegean Stole from knit.wear Spring/Summer 2018 is just the thing you need this spring—and all year! It’s a gorgeous, all-season project that you can dress up or down. Best of all: you can wear it any number of ways. Sure, you can just drape it around your shoulders, but this piece is a lot more versatile than that! And for those of you that are craving an introduction to lace, look no further. This project is rated at a level of “Easy.” What are you waiting for? To give you an idea of the styling potential of this particular accessory, here are my five favorite ways to wear the Aegean Stole. It’s a classic for a reason, folks. This style can be dressy or casual, but it’s always sophisticated. Plus it adds a good bit of warmth, so it’s perfect for spring events where the weather might be unpredictable (or summer events in overly air-conditioned spaces). Full-on drama is the name of the game with this style. Wearing the Aegean Stole this way really lets the pattern—and your knitting—shine. I recommend pairing this style with a dress or top that has an open back and then hitting the town. 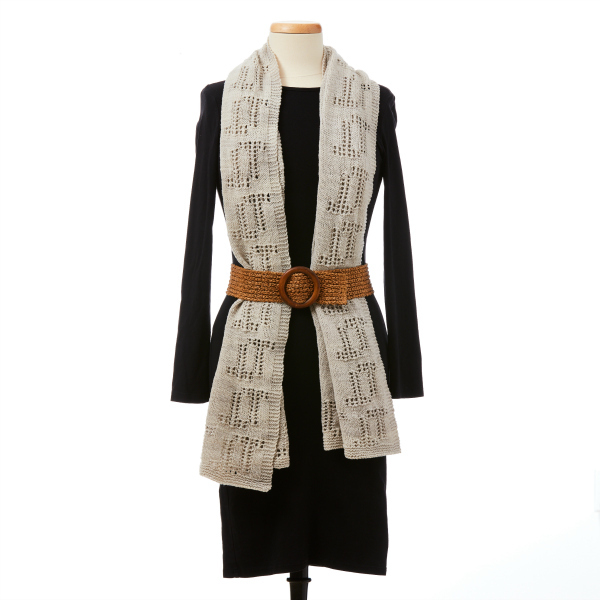 For a unique look, try the Aegean Stole belted! It’s a great way to add flair to any outfit. To create this look, simply let the stole hang loose from your neck and then fasten a belt over it. I love this look over a cute dress or with jeans and a simple sweater on cool days. 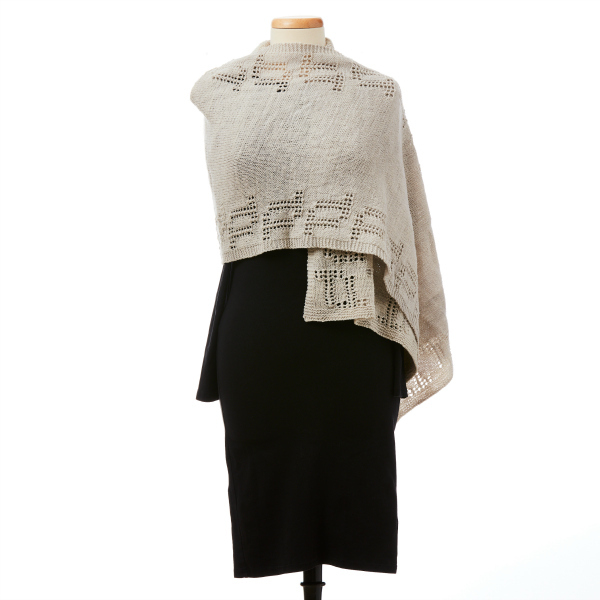 Spring mornings and nights can be chilly, so keep warm by wrapping up in this stole. Center the stole on the back of your neck, then wrap both ends around your neck and tuck them into the loops you created. Or you can let them peek out—however you like it! 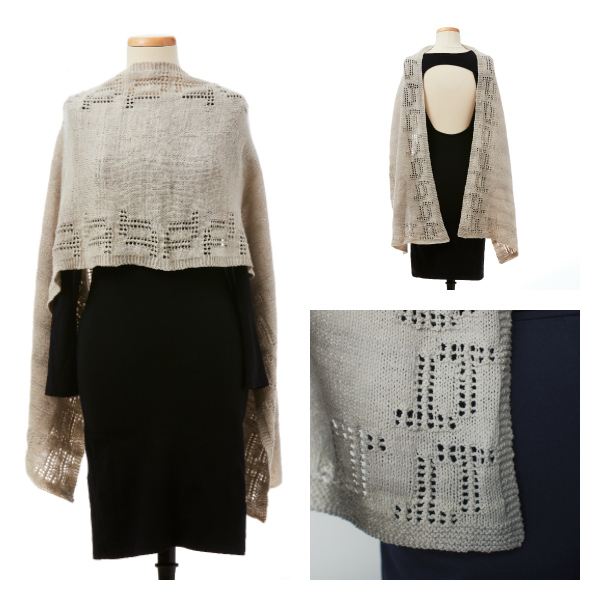 Create a faux shrug with this stylish, sophisticated look. Simply center the stole on your neck, then tuck both sides under your arms and either let the sides hang loose or pin them in the back with a shawl pin. I love that this style adds both drama AND warmth to an outfit! Bonus! For a different take on a traditional half-hitch scarf, give this style a try. Hang the stole around your neck with one end significantly longer than the other. Wrap the longer end around your neck, creating a loose-ish loop, then tuck what’s left of the long end into the loop. Easy-peasy, and so cute! I’m sure there are plenty of other ways to wear this versatile knitted stole—let me know your favorite in the comments! Originally posted on April 10, 2018. Updated on February 20, 2019. 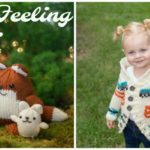 More Versatile Projects to Get on Your Needles!